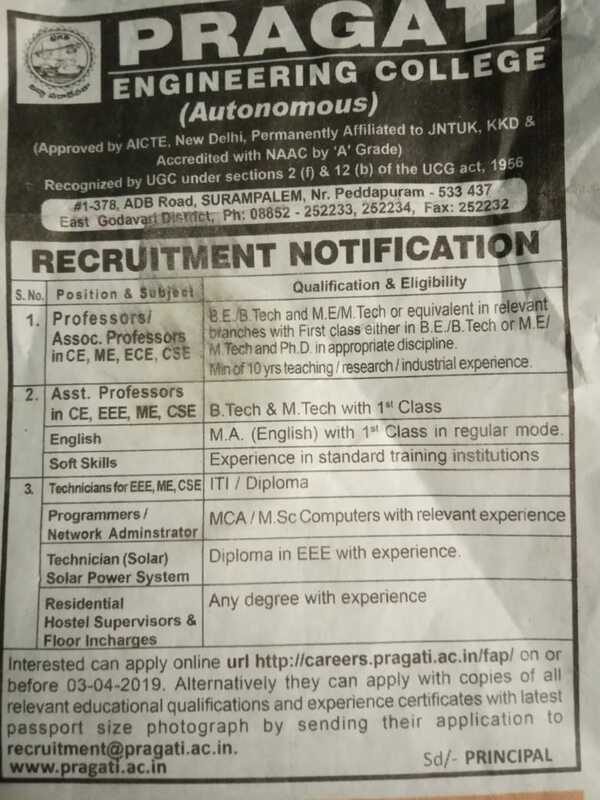 PRAGATI Engineering College Jobs 2019: PRAGATI Engineering College has invited online applications for Professors/Assistant Professor/Programmer/Technicians Vacancies. Eligible candidates can apply online for these jobs form 26-03-2019 to 03-04-2019. Required Documents are all Educational Certificate copies and Experience certificate with latest Pass Port size Photograph send the College Email-id Address are maintained below. 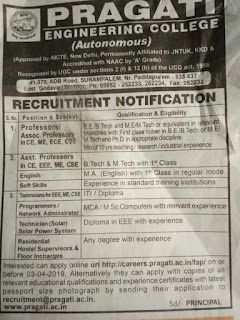 More information refer the official website www.pragati.ac.in for PRAGATI Engineering College Jobs for Professors/Assistant Professor/Programmer Posts. Salary, Qualification, College Address e.t.c are maintained below. Starting date to apply for Professors/Assistant Professor/Programmer Jobs: 26-03-2019. Ending date to apply for Professors/Assistant Professor/Programmer Jobs: 03-04-2019. Minimum of 10 Yrs Teaching/Research/Industrial Experience. Interested candidates can apply online url http://careers.pragati.ac.in/fap/ and all Educational Certificate copies and Experience certificate with latest Pass Port size Photograph by sending their application to College Email-id Address which is given below.